'Introduction to Bioinformatics' provides an accessible and thorough introduction to a subject which has become a fundamental part of biological science today. The aim of the book is to integrate a understanding of the biological background of bioinformatics with development of necessary computing skills. Bioinformatics is the collective name for a set of skills that has now become arguably one of the most important information-gathering and knowledge-building tools in current science research. The increase in the reliance upon bioinformatics in current research has made it essential for training in these skills to become an integral part of current science education. 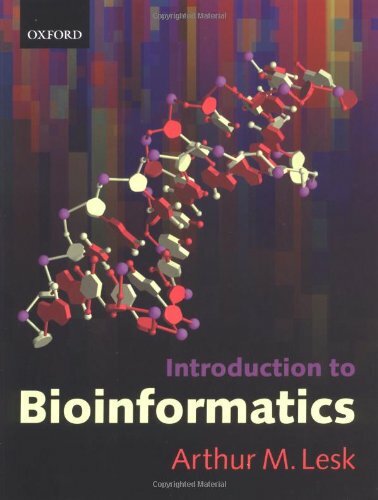 Introduction to Bioinformatics is a timely and much-needed textbook which provides an accessible and thorough introduction to a subject which has become a fundamental part of biological science today. As a pioneer of the use of bioinformatics techniques in research, Dr Lesk brings unrivalled experience and expertise to the study of this field. The aim of the book is to integrate an understanding of the biological background of bioinformatics with development of necessary computing skills. Without describing computer science or sophisticated programming skills in detail, the book supports and encourages the application of the many powerful computational tools of bioinformatics in a way that is both relevant to and stimulating for the reader. The book contains numerous problems and innovative Weblems (for Web-based Problems) to encourage students to engage with the subject and, with the accompanying web site, to develop a working understanding and appreciation of the power of bioinformatics as a research tool. Web site www oup.com/uk/best.textbooks/biochemistry/bioinf/ A logo in the text alerts the reader to check the web site for the full text of programs referred to in the book. The web site also has links related to the book's problems, the innovative Weblems (for Web-based Problems), to encourage students to engage with the subject and, with the web site, to develop a working understanding and appreciation of the power of bioinformatics as a research tool.